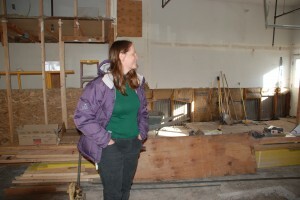 Claire Jacobi inspects construction on Literacy Outreach and the Teo Prinster Learning Center renovation. One of the multiple partners that have made the renovation of 1127 School Street possible is Claire Jacobi. Maria Claire Jacobi, a structural engineer with Glenwood Structural and Civil, Inc., has donated countless hours visiting buildings and creating plans. When things didn’t go exactly as planned, Claire redrew the plans! We could not have done it without her. Literacy Outreach is relocating in late March to 1127 School Street in downtown Glenwood Springs. An anonymous donor donated the building. With another generous gift from Carolyn Prinster in honor of her late husband, Leo T. Prinster, renovations have begun on the building. For the first time in our 26 year history, Literacy Outreach staff will enjoy windows and sunbeams in our office!